Stock up on Chocolate Bars on Amazon! Hurry and get the MARS Chocolate Full Size Candy Bars Variety Pack 53.68 Ounces (30-Count Box) today for only $16.79 from Amazon! Check out all of the Amazon deals here! Find everyone’s favorite chocolate candy bars in one place with the MARS Chocolate Full Size Candy Bars Variety Pack. 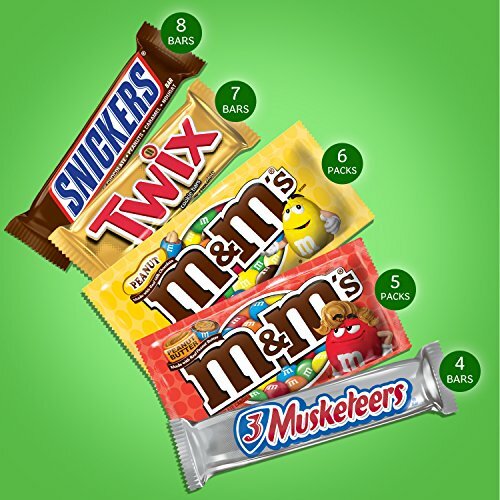 This assorted chocolates box features thirty full-size candy bars, including (8) SNICKERS Chocolate Bars, (7) TWIX Caramel Cookie Bars, (6) Peanut M&M’S Chocolate Candy, (5) Peanut Butter M&M’S Chocolate Candies, and (4) 3 MUSKETEERS Candy Bars. Great for stocking the office pantry, filling Easter basket or passing out to trick-or-treaters, this bulk chocolate mix of full size bars has enough delicious candy to keep the fun going. Add delicious fun to everyday celebrations and special events with MARS Chocolate Candy. Buy the MARS Chocolate Full Size Candy Bars Variety Pack 53.68 Ounces (30-Count Box) from Amazon. Previous articleOxiClean Powder Stain Remover – Hot (1 Day Only) Deal!